Xiaomi is at it again, this time they have just launched another midrange smartphone after the Xiaomi Note 5A. 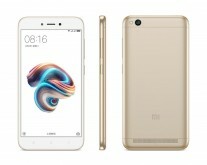 Xiaomi Redmi 5A has just been launched sporting 5-inch display with 720p resolution. It’s powered by Snapdragon 425 chipset coupled with 2G RAM + 16G internal memory storage. Power will be delivered through 3000mAh Non-Detachable battery. For the camera department, it houses 13MP rear facing shooter, featuring f/2.0 aperture for taking in more light when taking pictures. For the selfie shooter, it has been equipped with 5MP snapper and f/2.2 aperture. For making some videos with Xiaomi 5A 1080p @30fps is what is aboard.